4K UHD vs 1080P Full HD: Should You Upgrade or Not? Let's get down to the business. 1080P full HD resolution is composed of two million pixels (1920 x 1080), while a 4K (aka Ultra High Definition) has over eight million pixels (3840 x 2160). Theoretically, 4K Ultra HD has around four times more resolution than 1080p Full HD. Does this mean 4K UHD is superior to 1080P? To some extent, Yes! But in concrete terms, not really. Why do I say so? I bet after reading the following side by side comparison between 4K and 2K, you would understand. Free download 4K UHD and 1080p HD videos for testing! 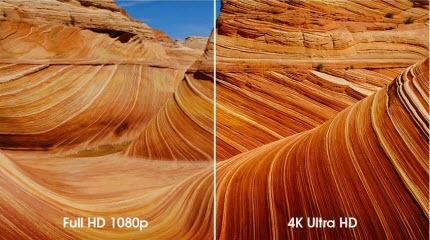 Many a user regards 4K UHD as a "stupid idea", for our human eyes can not recognize the difference between 4K ultra HD and 1080P full HD based on the scientific test. And if you insist distinguishing the difference, the optimum choice is that you closely put your face to the display screen. Oppositely, some guys firmly believe that they can clearly see the difference in sharpness between 4K and 1080P, even though they sit in a normal distance. Well, the question is that: Which opinion is right? Keep reading and you will get it. To figure this problem out, Digital Trends conducts a meaningful experiment. The details of this experiment are omitted on account of limited time. Yet, I can ensure you that this experiment is definitely objective and scientific. And the experiment result shows that obviously 4K UHD brings us with far more exquisite pictures than 1080P during playback on 4K video players, 4K TVs or other 4K available devices. And the same applies to the compressed video. 4K vs 1080P in Visual Acuity: 4K UHD Wins! When it comes to the place to find and download 1080P video, you might be immediately think of all manner of source to dig out and download 1080P video, for 1080P video is widely used almost anywhever. Comparatively speaking, it's much harder for you to search and download 4K videos as very few sources provide 4k content. Currently, it is only available on some titles on 4K video sites like Netflix, YouTube or Sony's Video Unlimited. 2160P vs 1080P in Video Source: 1080P Wins! * Some 4K UHD videos are composed of different codecs like HEVC, H.264, MPEG-4 etc., resulting in incompatibility with the majority of devices. * Certain mobile devices, boasting to support 4K video, may just stretch their blanket to attract buyers without this practical function. * The 4K video, with higher resolution, is usually accompanied with larger file size than 1080P, which might lead to the video file storage problem. 4K vs 1080P in Device Compatibility: 1080P Wins! Verdict: After side by side comparison between 4K UHD and 1080P full HD, you might have a deeper comprehension about these common resolutions. It's a tad subjective to make a judge on which one is better. Which one is more practical and more suitable for you matters more. After all, you are the one to decide which one to use more frequently or not. For a more accurate decision, here's the summary of 4K UHD and 1080p HD pros and cons. 1. 4K is greater for fine details in close range compared to 1080p. 2. You can shoot 4K on iPhone or camcorders, and then downscale your files to 1080p. 3. 4K has less nosie, and it gets better for low light video. 4. 4K videos are easier to crop and stabilize in post. 1. You can edit 1080p fast, and more computers are compatible to do so. 2. On small screens like mobiles and tablets, 1080p looks the same as 4K ultra HD. 3. 1080p is more ideal for uploading to YouTube, Facebook, and so on. 4. 1080p is also smaller, thus you can store more files on your devices. 1. You need 4K monitors, TVs or video player to view it in full experience. 2. A fairly fast computer is needed to edit and process large 4K files. 3. There is little to no difference when watching 4K on a 1080p mobile screen. 4. 4K is beneficial for small details, but the general image is nearly the same as 1080p. 1. 1080p is not as sharp as 4K. 2. 1080p highlights and shadows aren’t as good as 4K. Part 2: How to Play 4K UHD on Mobile Devices as Smooth as 1080p? 4K ultra HD video is of course much sharper than 1080p in image quality. But the question is that higher quality brings bigger file size. A 10min 1080p 30fps footage requires around 1.5GB storage while 4k video at the same length steals over 3.5GB of your free space. Still though iPhone is claimed to support 4K UHD video plaback since iPhone 6 or iPhone 6 Plus shipped with A8 chip, the two models only come 1334 × 750 and 1920 × 1080 resolution respectively. That is to say, even if you're able to play 4K video on iPhone, it will lose some of the quality. So how can you play 4K UHD as smoothly as 1080p full HD? You need do a 4K video processing indeed! MacX Video Converter Pro is the second-to-none 4K video processing tool, which enables you to compress 4K video to 1080p video formatted with MP4, FLV, WMV, etc video formats, convert 4K UHD directly to any mobile devices (420+ device profiles), all iPhones, iPads, Samsung, Sony, HTC, etc. with comparatively smaller file size and up to 98% quality kept. What's more, it's awfully easy-to-use and fast with the support of Hardware acceleration. Only 3 steps can make things done: load your 4K video > choose output profiles (target mobile device) > tap RUN! 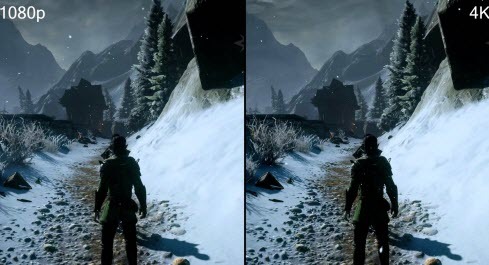 1440P vs 1080P: Compare 1440P with 1080P, this might be more helpful to game lovers. According to the specs and test, the 1440p resolution will look a lot nicer. With 1440P in 300cd/m² and 1080P in 250cd/m² brightness, the more pixels make dark colors dark and light colors really pop. For game buffs, it's worth your first-hand experience and later to decide 1440P or 1080P more suitable for gaming. 1080P vs 1080i: The difference of 1080P and 1080i lies in how the display lines are scanned. While both resolution standards display 1080 vertical lines, with 1080i the lines are "interlaced" - the odd-numbered lines go first then carried on with the even-numbered lines. On the contrary, the lines of 1080P are displayed constantly in a single pass, as opposed to the odd-numbered lines alternating with the even-numbered lines. 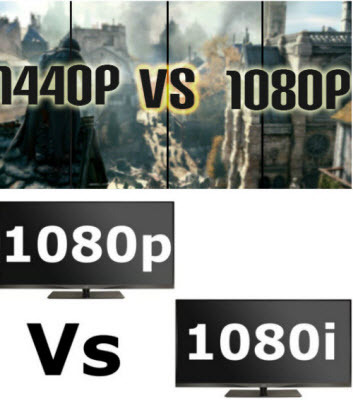 Other aspects about 1080P and 1080i are much of muchness.